We offer many different services to our faculty. Whether you are looking for a faculty development workshop, a one-on-one consultation, classroom observations, course design assistance, or simply a venue to interact with the campus community, you will find it here. develop their teaching into a source of research and inquiry. What is involved? Tailored to the individual faculty member's needs, the individual consultation process begins with an initial meeting to determine your project goals. Upon determining goals and outcomes, your CETL consultant will provide available support, knowledge, and resources to complete the mutually agreed-upon tasks. Our goal is simply to help - however you may need it. How? Visit the link below to schedule your consultation, and a CETL team member will contact you. Depending on the nature of the request and the specific needs, the appropriate and available consultant will be assigned to you. When? Anytime, but we do recommend that you are allow adequate time to meet, plan, and develop projects. We are available all year round. It is perfectly acceptable to reserve time for the following summer during the prior fall. Confidentiality: We do not evaluate, nor do we share information (including digitally developed materials or video) gathered during consultations with those who we do evaluate. We do not (1) release the names of those who seek consultation unless authorized by those seeking consultation; (2) release information about feedback or services requested; or (3) make copies of consultation materials (including videos). All materials become the property of the instructor requesting consultation upon completion of the project. To schedule an observation, click here. CETL offers formative, confidential and voluntary in-class observations upon request. What is involved? The first question that you will be asked is, "What do you want us to look for while you teach?" In other words, what are your needs and goals? In addition, we know that the classroom is a complex environment; therefore, do not expect any observation to a one-size-fits-all "checklist" of actions to be a good teacher. The observation and feedback process is designed to explore the instructor's approach to pedagogy and communication of their discipline. Supplementary evidence of teaching (syllabus, class session plans, class learning goals, and learning activities) will be reviewed prior to the observation to better understand the learning environment. How? Visit the link below to schedule your observation, and a CETL team member will contact you. You will be assigned an observer based on scheduling needs and qualifications. Note: CETL observers have received specialized training in classroom observation, which is guided by research and practice. To schedule a SGIF, click here. What is involved? Classroom Instructional Feedback takes approx. 20 minutes and is conducted while faculty members are not in the classroom learning environment. Trained Center professionals conduct a brief survey that includes questions like, "What aspects of this class do you feel are particularly effective for helping you learn the course materials? ", and 'What suggestions do you have for improving your learning in this class?" This information is then collected and reported back to the faculty member. What do the Center Team members tell the students? We introduce ourselves and explain that a) we are there at the faculty member's request, because s/he really wants to know how they can improve their learning; b) we want honest, specific, and constructive feedback; c) that this class time must not be used as a complaint session; d) information will be collected and randomly ordered to protect anonymity; and e) students can expect a follow-up classroom discussion on the collected information. 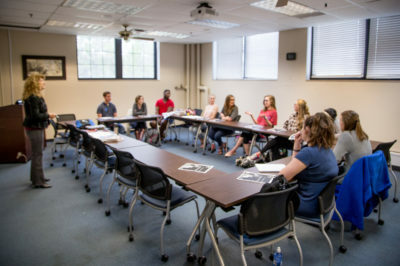 The Process: Faculty members are required to meet with the trained center team member before and after the Classroom Instructional Feedback session. Post-collection meetings occur within one week of the event. Why? By all accounts, SIGFs positively impact student-faculty relationships and emerging research indicates that they also positively impact faculty's end-of-semester evaluations. Note: There is one exception to this rile: CIFs can work against faculty members if they do not follow up with students after and discuss how the learning environment will change in response to the information collected. To see the schedule of all upcoming workshops & classes, click here. CETL offers many informative workshops each year. Workshops topics range from technology to pedagogy, and offer a hands-on approach to faculty and staff development. Participants will interact with other OKCU community members, and leave with tools they can use in their classrooms or offices. The goal of every CETL workshop is to improve the teaching and learning here at OKCU. Participants will receive Certificates of Participation for workshops they attend, which can be used as evidence of professional development.